When I was seven, I was helping my aunt clean the house. We were going through a large cupboard filled with old magazines and newspapers. As I helped her arrange the newspapers into stacks and the magazines according to the length (yes, I've been an OCD freak from a long time), I found a tiny book among it. Something about it made me not want to give it away. I asked my aunt if I could have it and she said yes. I kept the book aside and helped her finish the chore. Later that night, when I came back home from play, I sat down to read the book. It was a fairly small book but I sat through half the night to finish it. The mystery enveloped me like fire and soon I was burnt with the desire to read more of such books and be a part of the detective squad. 'Secret Seven Fireworks' was that book. And I had only just discovered the beauty of Enid Blyton's writing. There was no looking back after that. Right from my school library to the library near home, I borrowed as many books as possible and soon I was done with all the 'Secret Seven' books. Soon, within my group of friends we were using a password to reveal secrets and every dog looked like Scamper to me. I was in love with all the kids, Peter and Jack in particular. There were so many mysteries that these seven solved and each one was unique in its own way. I picked up the 'Famous Five' soon after and then fell in love all over again. Julian and Timmy became my best friends and I dreamt of solving mysteries with them. It was so easy to read these books and yet not get bored of them. Every mystery was different from the other and not once it was forgotten that it is children who are actually uncovering the mystery. It was realistic and not too far fetched. I read about lemonade, ginger ale and muffins for the first time and asked my mom to make her own versions of that for my party at home with my friends. It was quite an experience. Most of friends were not readers at that time and I clearly was the book queen of the pack. Suddenly everything around seemed like a mystery and I was hell bent upon solving it. Unknowingly I had turned into Enid Blyton and had turned myself into a character from her book. During late 90's I've read her books from the 30's and 40's. What a delight it was. It was not easy to find these books. Since most of them were really old, I found some with torn pages and covers. Still, I borrowed them and sat down at home to repair them with glue and clear tape before reading. After I was done with the 'Famous Five', I moved on to 'The Find-Outers'. 'The Mystery Of The Disappearing Cat' is my favorite book of the lot. I loved Fatty and Buster and thought that they were smart and delightful. Reading Enid Blyton's books improved my reading, writing and speaking skills. Since most of her characters were proper, well brought up kids, I tried to be like them as well. People often say that my approach to life is a little western, it is because of all the reading I did as a child. And you know what, I have no regrets what so ever. Just like Agatha Christie, Enid Blyton too increased my love for books and the genre of mystery in particular. While Agatha Christie's writing was more description and dialogue oriented, Enid Blyton's was much simpler with easy conversations and layouts. For a beginner, I would always suggest Enid Blyton first. Apart from her series, I have read a lot of her other books like 'The Enchanted Wood', 'The Magic Faraway Tree', 'Malory Towers', 'The Wishing Chair' etc. While her mystery series was brilliant, her fantasy oriented novels was splendid as well. When you read this as a child, it fills you with so much hope and bring out a new found love for life thanks to the discovery of magic. The language she uses in her books is sophisticated and yet easy to understand. The tales she spins and the scenes she sets making reading a wonderful experience. I do own a few of her books at present thanks to my finds at Bookworm. I can get brand new box sets of all her series. In fact I once saw all of them together and almost shelled out a major chunk of my salary to buy them. They are expensive no doubt, but that is not why I did not buy them. They felt way too new and polished. It just did not give me the right feel. When I went back to Bookworm and asked for old copies, I did find some. I've asked the guy out there to set aside old copies in good condition for me so that I can form my own collection with them. Half of my Secret Seven collection is complete, while I only have a couple of books from the Famous Five and the Find-Outers. Probably I'll drop in to my favorite bookstore over the weekend and pick up a few others. Did you read Enid Blyton as a child? Which of her books is your favorite? I have NO favorites. I have read them all. Enid Blyton was my childhood pal. Did you know there are adult Enid Blytons now? Enid Blyton's Famous Five spoofed in 'adult' books, in fact by Bruno Vincent. :-) Hugs! Spoofed ones? Nah, not for me. Enid Blyton was my absolute favourite! I loved her books and still do. I preferred Five Find outer over Famous five. But Malory towers and St Clare's were my overall favourites. I'd dream of going to boarding school like them. I think I wrote a post on my personal blog on this last year. Find Outers were my favorite of the lot too. Didn't we all start with Enid Blytons in school? It was a rage back then. 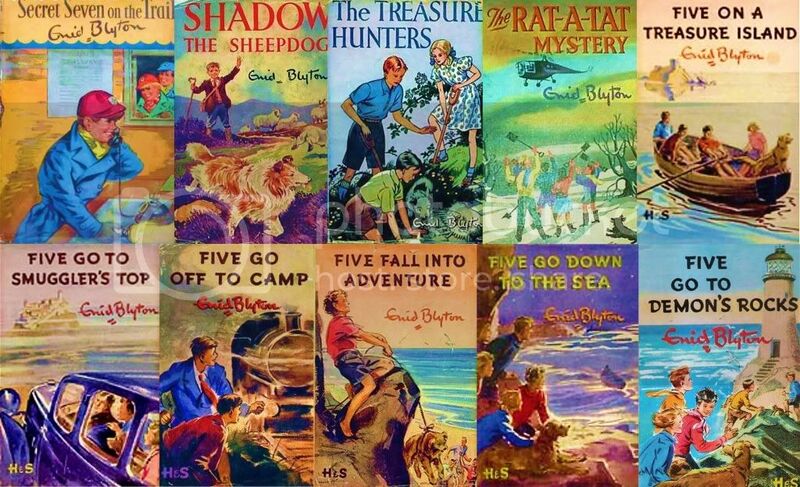 And now, Enid Blyton is my all time favorite as a gift to kids for their birthdays, to inculcate the love of reading in them and to introduce them to the beautiful world of adventure, mystery and history! These authors form the starting of a reading relationship for young kids - Enid Blyton, Agatha Christie, the Hardy Boys and Nancy Drew series. I used to love the 3 investigators series by Alfred Hitchcock too. Definitely. This should be made mandatory reading in all schools. We all grew up reading the stories and hoped to live them. I began with her books...and I think I must have read most of them! Incidentally, my son also started with her books, so I got to all those books all over again! You son has good taste for sure. I have read too many Enid Blytons. They were my first novels too. When we were small, DD used to telecast Sunday episodes of Famous Five. I fell in love with Julian right away. The series is available on Youtube too. It had a nice lilting starting song. You can check it out. DD used to telecast famous five? Why didn't I know about it? I'm Youtubing it right away! The thing is, Enid Blyton books (and other similar books) form the foundation stone for all the reading one will ever do in life. If you don't read Enid Blyton, it does get pretty tough to pick up reading at a later stage! I guess it's because of the way she makes reading so appealing to kids, specially at an age where kids would rather be playing on their phones/ eating sweets/wasting time. You are my twin soul when it comes to most books! No wonder we like each other. Enid Blyton's school series and the Faraway tree series is what made me fall in love with her writing, although I've enjoyed everything she's written, of course. Okay, that Bookworm visit HAS to happen now! I love Enid Blyton! Because it was through her books that I developed the love for reading and especially reading mystery! I usually bored the books from one of my family friends. And when I finally managed to buy a Enid Blyton book, my joy knew no bounds. Oh so many many memories. Thanks for writing this and bringing them all back. The smell of yellowed pages of books from the school library!! I think my favorite was The Saucy Jane Family. He is officially a person who made most of the readers 'readers'. 'Five go to Mystery Moor' was the first book I read from him; recived it as a part of academic prize in school, then there were countless from school library :D Ah! Those were the days! I used to love her! I started off with Famous Five, then there was something she had written for younger kids, I forgot what it was called, something about a stout old man. I used to keep borrowing her books from the school library, and were even some of the first books I'd owned. Aw the nostalgia! <3 I've been thinking of writing something about her on my other blog for a while now. Just gathering my thoughts.